Tuesday, August 12, 1980—went fishing in Mendeltna creek on Oilwell road. We got 20 salmon (We can the meat). Walked in to Peter’s cabin to check it for him and it was okay. 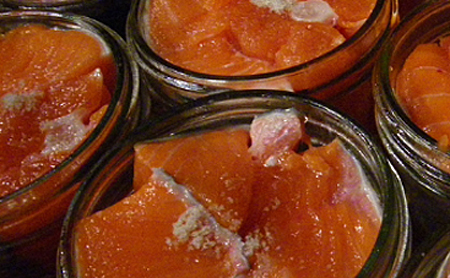 Wednesday, August 13, 1980—went salmon fishing again and Scott, Doug and I, we got nine and we canned them that night. Nine fish made eleven quarts, canned. Thursday, August 14, 1980—Chad, Trish and Frank Wilson came. Chad and family and Sylvia and I went to Lila Lake near Gunsight and caught a few grayling. Chad and I and the boys went across the lake to an outlet and fished there and the grayling were just thick! Mike P. tells me that fish and game stocked rainbows in his and other lakes in the area. Crater Lake for one, and Round Lake too, on the Lake Louise Road. In later years they maintained that and it is good fishing. Friday, August 15, 1980—hauled more gas for the lodge. Chad went with us to Arizona Lake (it’s a grayling lake) but today the fishing was poor. We stopped and visited Mike and Lynette on the way home. Saturday, August 16, 1980—Went to see Dan Billman and helped kill eleven chickens. Sylvia is an old hand at butchering chickens. They wanted her there to show them how to do it. Met Denny Billman, Dan’s brother, and his step-father Loyd. Dan’s mother and stepfather own Anchorage Tank. Seemed like a really nice guy and we grew to be friends. Sunday, August 17, 1980—Mike and Lynette needed help moving a refrigerator and a freezer. Monday, August 18, 1980—helped at the lodge again and Sylvia picked a few blueberries. Sylvia was across the highway at the base of Slide Mountain on her hands and knees picking blueberries, engrossed in her work, when suddenly she feels something at her behind. She’s thinking, “Oh my gosh, it must be a bear!” But when she turned, it was the lodge dog—whose name happened to be “Bear”. It sure frightened her. This entry was posted in Journal Entry and tagged berry picking, butchering chickens, catching and canning salmon, grayling. Bookmark the permalink.